The purpose of this study is to provide evidence-based and expert consensus recommendations for lung ultrasound with focus on emergency and critical care settings. A multidisciplinary panel of 28 experts from eight countries was involved. Literature was reviewed from January 1966 to June 2011. Consensus members searched multiple databases including Pubmed, Medline, OVID, Embase, and others. The process used to develop these evidence-based recommendations involved two phases: determining the level of quality of evidence and developing the recommendation. The quality of evidence is assessed by the grading of recommendation, assessment, development, and evaluation (GRADE) method. However, the GRADE system does not enforce a specific method on how the panel should reach decisions during the consensus process. Our methodology committee decided to utilize the RAND appropriateness method for panel judgment and decisions/consensus. Seventy-three proposed statements were examined and discussed in three conferences held in Bologna, Pisa, and Rome. Each conference included two rounds of face-to-face modified Delphi technique. Anonymous panel voting followed each round. The panel did not reach an agreement and therefore did not adopt any recommendations for six statements. Weak/conditional recommendations were made for 2 statements, and strong recommendations were made for the remaining 65 statements. The statements were then recategorized and grouped to their current format. Internal and external peer-review processes took place before submission of the recommendations. Updates will occur at least every 4 years or whenever significant major changes in evidence appear. This document reflects the overall results of the first consensus conference on “point-of-care” lung ultrasound. Statements were discussed and elaborated by experts who published the vast majority of papers on clinical use of lung ultrasound in the last 20 years. Recommendations were produced to guide implementation, development, and standardization of lung ultrasound in all relevant settings. The online version of this article (doi: 10.1007/s00134-012-2513-4) contains supplementary material, which is available to authorized users. Modern lung ultrasound is mainly applied not only in critical care, emergency medicine, and trauma surgery, but also in pulmonary and internal medicine. Many international authors have produced several studies on the application of lung ultrasound in various settings. The emergence of differences in approach, techniques utilized, and nomenclature, however, provided the stimulus to initiate a guideline/consensus process with the aim of elaborating a unified approach and language for six major areas, namely terminology, technology, technique, clinical outcomes, cost effectiveness, and future research. This process was conducted following a rigorous scientific pathway to produce evidence-based guidelines containing a list of recommendations for clinical application of lung ultrasound . A literature search was performed, and a multidisciplinary, international panel of experts was identified. The proposed recommendations represent a framework for “point-of-care” lung ultrasound intended to standardize its application around the globe and in different clinical settings. This report constitutes a concise, shortened version of the original document. The electronic version, accessible online as supplementary material, provides a full explanation of methods and a comprehensive discussion for each recommendation (see Electronic Supplementary Material 1). Grading of recommendation, assessment, development, and evaluation (GRADE) method was used to develop these evidence-based recommendations . The process involves two phases: (1) determining the level of quality of evidence, and (2) developing the recommendation. 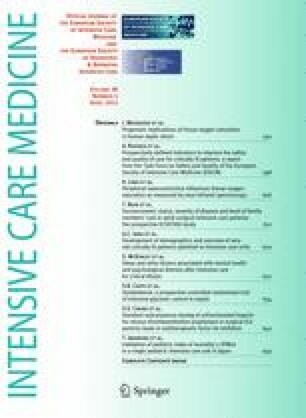 Relevant articles with clinical outcomes were classified into three levels of quality based on the criteria of the GRADE methodology for developing guidelines and clinical recommendations (Table 1). RAND appropriateness method (RAM) was used within the GRADE steps that required panel judgment and decisions/consensus . RAM was also used in formulating the recommendations based purely on expert consensus, such as recommendations related to terminology. Recommendations were generated in two classes (strong or weak/conditional) based on the GRADE criteria taking into consideration preset rules that defined the panel agreement/consensus and its degree. The transformation of evidence into recommendation depends on the evaluation by the panel for outcome, benefit/cost, and benefit/harm ratios, and certainty about similarity in values/preferences . Experts were eligible for selection if they had published as first author a peer-reviewed article on lung ultrasound during the past 10 years in more than one main topic of lung ultrasound (pneumothorax, interstitial syndrome, lung consolidation, monitoring, neonatology, pleural effusion), taking into consideration the proportionality as determined by a MEDLINE literature search from 1966 to October 2010. Methodologists with experience in evidence-based methodology and guideline development were also included (see “Appendix” for list of participants, affiliations, and assignments). The literature search was done in two tracks. The experts themselves, with more than one expert search in each domain to avoid selection bias, constituted the first track. An epidemiologist assisted by a professional librarian performed the second track by conducting literature search of English-language articles from 1966 to October 2010. See Table 2 for search databases, terms, and the MeSH headings used. The two bibliographies were compared for thoroughness and consistency. The panel of experts met on three occasions: Bologna (28–30 November 2009), Pisa (11–12 May 2010), and Rome (7–9 October 2010). The panelists formulated draft recommendations before the conferences, which laid the foundation to work together and critique the recommendations during the conferences. At each plenary conference, a representative of each domain presented potentially controversial issues in the recommendations. A face-to-face debate took place in two rounds of modified Delphi technique; after each round, anonymous voting was conducted. A standardized method for determining the agreement/disagreement and the degree of agreement and hence for deciding about the grade of recommendation (weak versus strong) was then applied [3, 4]. A total of 209 articles and two books were retrieved by the first track search. An additional 110 articles were added from the second track over a 1-year period. These 320 references (see Electronic Supplementary Material 1) were individually appraised based on methodological criteria to determine the initial quality level. The final judgment about the quality of evidence-based recommendations was only done after assigning the articles to each statement/question. A total number of 73 proposed statements were examined by 28 experts and discussed in the three conferences. Each statement was coded with an alphanumeric code, which includes the following in order of appearance: the location of the conference (Bologna, B; Pisa, P; Rome, RL), the number assigned to the domain, and the number assigned to the statement. Table 3 presents each statement code with its grade of recommendation, degree of consensus, and level of quality of evidence. Adjunct techniques such as M-mode and color Doppler may be used. Ultrasound scanning for pneumothorax may be a basic ultrasound technique with a steep learning curve. During assessment for pneumothorax in adults, a microconvex probe is preferred. However, other transducer (e.g., linear array, phased array, convex) may be chosen based on physician preference and clinical setting. Lung ultrasound compares well with computerized tomography in assessment of pneumothorax extension. Comments The four sonographic signs useful to diagnose pneumothorax and their usefulness in ruling in and ruling out the condition are reported in Fig. 1 . Lung sliding is the depiction of a regular rhythmic movement synchronized with respiration that occurs between the parietal and visceral pleura that are either in direct apposition or separated by a thin layer of intrapleural fluid [6, 7, 8, 9]. The lung pulse refers to the subtle rhythmic movement of the visceral upon the parietal pleura with cardiac oscillations [6, 8, 10]. As B-lines (well defined elsewhere) originate from the visceral pleura, their simple presence proves that the visceral pleura is opposing the parietal, thus excluding pneumothorax at that point. 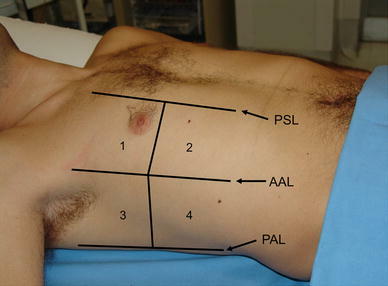 The lung point refers to the depiction of the typical pattern of pneumothorax, which is simply the absence of any sliding or moving B-lines at a physical location where this pattern consistently transitions into an area of sliding, which represents the physical limit of pneumothorax as mapped on the chest wall [7, 11, 12]. In extreme emergency, absence of any movement of the pleural line, either horizontal (sliding) or vertical (pulse), coupled with absence of B-lines allows prompt and safe diagnosis of pneumothorax without the need for searching the lung point. Lung ultrasound is more accurate than CXR particularly in ruling out pneumothorax [1, 6, 13, 14, 15, 16, 17]. There are some settings where lung ultrasound for pneumothorax is not only recommended but also essential: cardiac arrest/unstable patient, radio-occult pneumothorax, and limited-resource areas. Disagreement on the steep learning curve of the technique is based on the fact that the positive predictive value of ultrasound and its specificity have tended to be slightly lower than the sensitivity in the studies on pneumothorax. Consideration has been made that diagnosis of pneumothorax can require more nuanced interpretation of the combination of findings as lung bullae, contusions, adhesions, and others that can result in false positives. B-lines are defined as discrete laser-like vertical hyperechoic reverberation artifacts that arise from the pleural line (previously described as “comet tails”), extend to the bottom of the screen without fading, and move synchronously with lung sliding. The anatomic and physical basis of B-lines is not known with certainty at this time. The term “sliding” (rather than “gliding”) should be used in the description of pleural movement. Multiple B-lines are the sonographic sign of lung interstitial syndrome. A more rapid anterior two-region scan may be sufficient in some cases. The evaluation of 28 rib interspaces is an alternative. A positive region is defined by the presence of three or more B-lines in a longitudinal plane between two ribs. Two or more positive regions (see B-D2-S2) bilaterally. The 28 rib space technique may semiquantify the interstitial syndrome: in each rib space, count the number of B-lines from zero to ten, or if confluent, assess the percentage of the rib space occupied by B-lines and divide it by ten. The term “B-pattern” should be used (rather than “lung rockets” or “B-PLUS”) in the description of multiple B-lines in patients with interstitial syndrome. In the evaluation of interstitial syndrome, lung ultrasound should be considered as a basic technique with a steep learning curve. Lung ultrasound is a reliable tool to evaluate diffuse parenchymal lung disease (pulmonary fibrosis). The primary sonographic sign to be identified is the presence of multiple B-lines in a diffuse and nonhomogeneous distribution. Pleural line abnormalities are often present. In patients with diffuse parenchymal lung disease (pulmonary fibrosis), the distribution of B-lines correlates with computed tomography (CT) signs of fibrosis. Lung ultrasound is superior to conventional chest radiography for ruling in significant interstitial syndrome. In patients with suspected interstitial syndrome, a negative lung ultrasound examination is superior to conventional chest radiography in ruling out significant interstitial syndrome. Lung ultrasound used as a first-line diagnostic approach in the evaluation of suspected interstitial syndrome, when compared with chest radiography, may lead to better patient outcomes. In resource-limited settings, lung ultrasound should be considered as a particularly useful diagnostic modality in the evaluation of interstitial syndrome. Use of sonography in diagnosis of interstitial syndrome is likely to improve the care of patients in whom this diagnosis is a consideration. In suspected decompensated left-sided heart failure, lung ultrasound should be considered because, with other bedside tests, it provides additional diagnostic information about this condition. Comments Many studies showed a tight correlation between interstitial involvement of lung diseases and B-lines [10, 18, 19, 20]. The consensus process defined the basic eight-region sonographic technique (Fig. 2) and the criteria for positive scan and positive examination [19, 20, 21]. 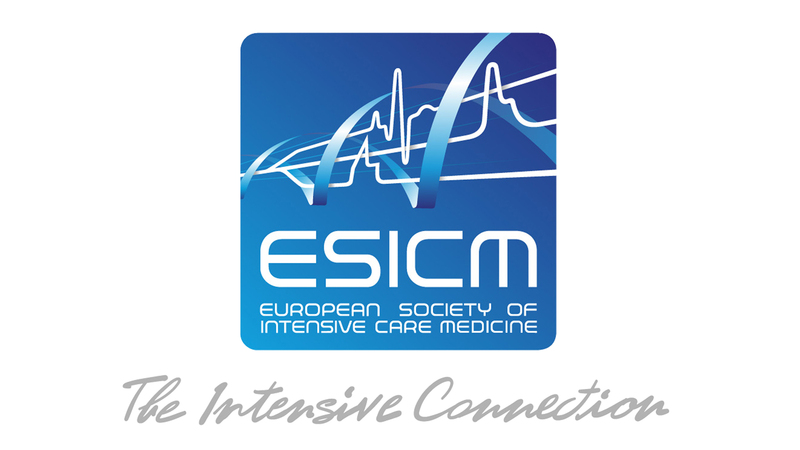 In the critically ill, a more rapid anterior two-region scan may be sufficient to rule out interstitial syndrome in cardiogenic acute pulmonary edema . A positive examination for sonographic diffuse interstitial syndrome allows bedside distinction between a cardiogenic versus a respiratory cause of acute dyspnea [22, 23, 24]. For more precise quantification of interstitial syndrome, the 28-scanning-site technique can be useful, especially in cardiology and nephrology settings . In acute decompensated heart failure, semiquantification of the severity of congestion can be calculated by counting the total number of B-lines (28-scanning-site technique) or the number of positive scans (eight-region technique) [26, 27]. A focal sonographic pattern of interstitial syndrome should be differentiated from a diffuse interstitial syndrome . Similar B-patterns are observed in many acute and chronic conditions with diffuse interstitial involvement [1, 19, 20, 25, 28, 29]. However, some sonographic signs other than B-lines are useful to differentiate the B-pattern of cardiogenic pulmonary edema, ARDS, and pulmonary fibrosis . The sonographic technique for diagnosis of interstitial syndrome is a basic technique [30, 31, 32] with superiority over conventional CXR . The sonographic sign of lung consolidation is a subpleural echo-poor region or one with tissue-like echotexture. The vascular pattern within the consolidation. Lung ultrasound for detection of lung consolidation can be used in any clinical setting including point-of-care examination. Lung ultrasound should be used in the evaluation of lung consolidation because it can differentiate consolidations due to pulmonary embolism, pneumonia, or atelectasis. Lung ultrasound is a clinically useful diagnostic tool in patients with suspected pulmonary embolism. Lung ultrasound is an alternative diagnostic tool to computerized tomography in diagnosis of pulmonary embolism when CT is contraindicated or unavailable. Lung ultrasound is a clinically useful tool to rule in pneumonia; however, lung ultrasound does not rule out consolidations that do not reach the pleura. Lower-frequency ultrasound scanning may allow for better evaluation of the extent of a consolidation. Lung ultrasound should be considered as an accurate tool in ruling in lung consolidation when compared with chest radiography. Lung ultrasound may be considered as an accurate tool in ruling out lung consolidation in comparison with chest radiography. Use of lung ultrasound as an initial diagnostic strategy in the evaluation of lung consolidation improves outcomes in comparison with chest radiography. Ultrasound diagnosis of lung consolidation may be considered as a basic sonographic technique with a steep learning curve. Lung ultrasound should be considered in the detection of radio-occult pulmonary conditions in patients with pleuritic pain. In the evaluation of lung consolidation, the sonographic technique should commence with the examination of areas of interest (if present, e.g., area of pain) then progress to the entire lung, as needed. In mechanically ventilated patients, lung ultrasound should be considered because it is more accurate than chest radiography in distinguishing various types of consolidations. In mechanically ventilated patients lung ultrasound should be considered as it is more accurate than portable chest radiography in the detection of consolidation. Lung ultrasound is accurate in distinguishing various types of consolidations in comparison with CT scan in mechanically ventilated patients. Comments The consolidated region of the lung is visualized at lung ultrasound as an echo-poor or tissue-like image, depending on the extent of air loss and fluid predominance, which is clearly different from the normal pattern [34, 35, 36, 37, 38]. The cause of lung consolidation can be diagnosed by analyzing the sonographic features of the lesion [39, 40]. Accuracy of lung ultrasound in the diagnosis and differential diagnosis of lung consolidation has been tested in different settings [36, 41, 42, 43, 44] and showed good accuracy compared with CXR [43, 45, 46, 47, 48]. In pleuritic pain, lung ultrasound is superior to CXR and may allow visualization of radio-occult pulmonary conditions [47, 48]. In mechanically ventilated patients, lung ultrasound is more accurate than CXR in detecting and distinguishing various types of consolidations [49, 50]. In patients with cardiogenic pulmonary edema, semiquantification of disease severity may be obtained by evaluating the number of B-lines as this is directly proportional to the severity of congestion. In patients with cardiogenic pulmonary edema, B-lines should be evaluated because it allows monitoring of response to therapy. In patients with increased extravascular lung water, assessment of lung reaeration can be assessed by demonstrating a change (decrease) in the number of B-lines. In the majority of cases of acute lung injury or ARDS, ultrasound quantification of lung reaeration may be assessed by tracking changes in sonographic findings. Sonographic findings should include assessment of lung consolidation and B-lines. Serial evaluation of B-lines allows monitoring of pulmonary congestion in patients on hemodialysis, but is of undetermined clinical utility. The semiquantitative techniques of B-line evaluation (see B-D2-S2 and B-D2-S4) are useful as a prognostic indicator of outcomes or mortality in patients with left-sided heart failure. Semiquantitative B-line assessment is a prognostic indicator of adverse outcomes and mortality in patients with acute decompensated heart failure. Comments The concept of using lung ultrasound for monitoring the patient is one of the major innovations that emerged from recent studies. Pulmonary congestion may be semiquantified using lung ultrasound [22, 25, 27, 51, 52, 53, 54, 55]. In the clinical arena, lung ultrasound can therefore be employed as a bedside, easy-to-use, alternative tool for monitoring pulmonary congestion changes in heart failure patients, as they disappear or clear upon adequate medical treatment [27, 56, 57, 58, 59, 60]. More generally, any significant change in lung aeration resulting from any therapy aimed at reversing aeration loss might be detected by corresponding changes in lung ultrasound patterns [61, 62]. Lung ultrasound is a clinically useful diagnostic tool in neonates with suspected respiratory distress syndrome (RDS). Lung ultrasound is as accurate as chest radiography in the diagnosis of respiratory distress syndrome in neonates. Lung ultrasound is a clinically useful diagnostic tool in suspected transient tachypnea of the newborn (TTN). The sonographic signs for transient tachypnea of the newborn are bilateral confluent B-lines in the dependent areas of the lung (“white lung”) and normal or near-normal appearance of the lung in the superior fields. Lung ultrasound is as accurate as chest radiography in diagnosis of TTN. Lung ultrasound is a clinically useful diagnostic tool in pediatric patients with suspected pneumonia. The ultrasound signs of lung and pleural diseases described in adults are also found in pediatric patients. Lung ultrasound is as accurate as chest radiography in diagnosis of pneumonia in pediatric patients. Comments In newborns, lung ultrasound signs are similar to those previously described in adults, although these signs will be context specific. Lung ultrasound allows diagnosis of RDS with accuracy similar to CXR even if there is no correlation between the different radiographic stages of RDS and ultrasound findings . Lung ultrasound demonstrates very unique findings in the diagnosis of TTN, whereas CXR is nonspecific . Many studies showed that the ultrasound signs of lung and pleural diseases described in adults are also found in pediatric patients [45, 65, 66, 67, 68]. In suspected pneumonia, lung ultrasound has demonstrated to be no less accurate than CXR. These data suggest that, when there is clinical suspicion of pneumonia, a positive lung ultrasound excludes the need to perform CXR. A pleural effusion with internal echoes suggests that it is an exudate or hemorrhage. While most transudates are anechoic, some exudates are also anechoic. Thoracentesis may be needed for further characterization. In the evaluation of pleural effusion in adults, the microconvex transducer is preferable. If not available, a phased array or a convex transducer can be used. The optimal site to detect a nonloculated pleural effusion is at the posterior axillary line above the diaphragm. For the detection of effusion, lung ultrasound is more accurate than supine radiography and is as accurate as CT. In opacities identified by chest radiography, lung ultrasound should be used because it is more accurate than chest radiography in distinguishing between effusion and consolidation. Comments Pleural effusion is usually visualized as an anechoic space between the parietal and visceral pleura. This condition can be obvious in patients with substantial effusion. In other conditions, such as complex effusion and in patients where pleural effusion is suspected, the sonographic technique can benefit from standardized criteria to improve diagnostic accuracy. The sinusoid sign is a dynamic sign showing the variation of the interpleural distance during the respiratory cycles [69, 70]. This variation is easily visualized on M-mode as a sinusoid movement of the visceral pleura . Lung ultrasound has the potential also for diagnosing the nature of the effusion . Visualization of internal echoes, either of mobile particles or septa, is highly suggestive of exudate or hemothorax [72, 73, 74, 75, 76]. However, when faced with an anechoic effusion, the only way to differentiate between transudate and exudate is to use thoracentesis or alternatively to evaluate effusion in the clinical context [71, 77, 78, 79]. Lung ultrasound accuracy is proved to be higher than CXR, particularly when anterior–posterior view in the supine patient is considered [49, 69, 70]. Lung ultrasound performance is nearly as good as CT scan [49, 80]. New research and knowledge will give impetus to update these guidelines by renewing the development process at least every 4 years or whenever a significant major change in evidence appears. A professional librarian will review literature on a regular basis and send any updates to the corresponding author. The panel is open to new inputs, and the position of new researchers and experts will be considered in the future before the next revision. This is the first document reporting evidence-based recommendations on clinical use of point-of-care lung ultrasound. Experts who published the vast majority of papers on clinical use of lung ultrasound in the last 20 years elaborated these specific 73 recommendations. A number of these recommendations will potentially reshape the future practice and knowledge of this rapidly expanding field. These applications will benefit patients worldwide as rigorous assessment, classification, and publication efforts continue to make this critical information available to all clinicians. The advantages of correct use of bedside lung ultrasound in the emergency setting are striking, particularly in terms of saving from radiation exposure, delaying or even avoiding transportation to the radiology suite, and guiding life-saving therapies in extreme emergency. This document was elaborated to guide implementation, development, and training on use of lung ultrasound in all relevant settings; it will also serve as the basis for further research and to influence and enhance the associated standards of care. Special thanks to the Cornell library staff for conducting the literature search, to Ms. Maddalena Bracchetti for her outstanding organizational and administrative support, and to all the secretariat staff. This study was endorsed by the World Interactive Network Focused on Critical Ultrasound (WINFOCUS).